Stephanie is our hostess and she chose the code word SEA. Then I splattered on some water. 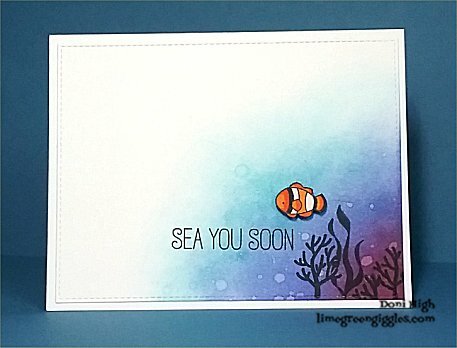 One of my favorite stamp sets is Mermazing by My Favorite Things. the cute fish ( popped up with foam dots) and called it done. Thanks for stopping by and I hope you can join us this week. I LOVE, LOVE, LOVE this, Doni! Your inked sea is fantastic - love the way it's in the corner and fades to white, and I love the little clown fish swimming areound among those wonderful sea plants. A wonderful take on the code word. I agree 100% with Stephanie, Doni...I LOVE THIS CARD!!! 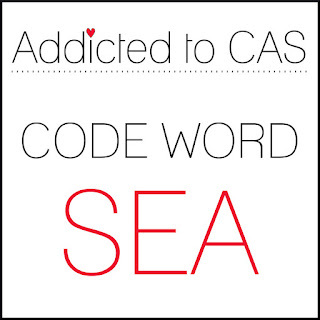 Gorgeous ink blending on your ocean and I love your CAS design...absolutely perfect in every way! This is SO COOL Doni! Fabulous idea and great job with those inks ... love it!! I'm presently in Bora Bora and looking at water colors very much like your card! Great job! Nemo! There you are on Doni's card. I love the images and inking all settled into the corner.